On many occasions, I was puzzled about why people are so much obsessed about the ‘like counts’ and ‘follower counts’ as measures of social media success. Particularly I get this feeling when looking at my Google Reader browser and going through hundreds of stories appearing there from various social media blogs I follow. 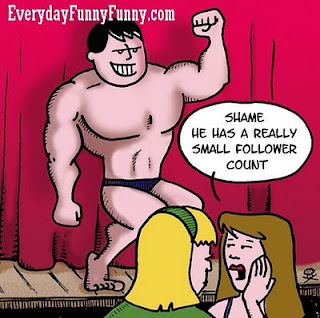 How many posts we see about certain shortcuts to increase follower counts or likes count? An interesting discussion took place this evening on Twitter, when someone tweeted saying “A twitter power user is one with over 100 followers and over 1000 tweets”. (This stat said to be coming from a survey, but unfortunately, I could not find any reference to such a survey by Googling for it with different search terms. If you know where to refer for the original survey, please post me a link). The thinking that anyone over 100 followers and 1000 tweets will automatically qualifies to be a “power user” is part of the ‘bean counter paradigm’ where you try to quantify everything into numbers and generalize it. Armed with information like this, we all get into the rat race of hunting for more followers and likes on Twitter and Facebook. Companies will throw thousands of dollars on sophisticated tools to automate tweeting, attract followers, and do what ever they can do to become “power tweeters”. In the end, your social media effort becomes merely a managing of a set of tools with the aim of attracting more followers and likes. But are we really doing the right thing? One mistake most companies are doing is, taking “social media” as a technology subject. Some companies are a little bit better, and they mistake social media to be a marketing subject. But in my opinion (which may be wrong, and which also is supported by many other bloggers as well) social media is not about either technology (no way!) or about marketing. The most important aspect of social media essentially is its “social” element. Power users on social media are not different to this. More than the number of followers or tweets, what you have to focus on is their ability to influence followers for behaving in a desired way. The desired actions may be to Re-tweets, @reply, or to click on a link provided in your tweet. Without this ability to influence, it is useless to have thousands of followers or tweeting 10,000 times. This is why I never endorse the cheap tactic of bulk following thousands of people on Twitter, with the hope of some of them start following you back. I have seen some brands, following about 2,000 people but only 100 or 200 are following them back. This doesn’t look good on your credibility. Anyone (with common sense) can guess, the 100 followers you are having are random people you collected through “follow back love”. If you build your follower base with this type of a strategy, you will invariably find it difficult to engage in a conversation with them, no matter if you tweet 1000 times or 10,000 times. So, does that make you a power user? How to Build Your Twitter Power? I always recommend you to be selective about who follows you. Define what you stand for on Twitter (Eg: I have defined myself as “Sri Lanka based marketing professional who also loves cricket”). Once you define what you stand for; you have to target followers with the same set of interests. This way, you slowly build up an audience who are receptive for what you tweet. Start with 10 followers; interact with them. Grow it to 50, then 100 and so forth. Never rush for numbers. Most people worry when someone unfollows them. I myself one who get delighted when people unfollow me. Because I know, if someone unfollows me, he/she doesn’t take my tweets as relevant for them. Better let them go, than just keeping for the sake of numbers. In summary, I believe social media is not about numbers. It’s not about the likes and tweets. It’s all about human relationships, only happening on a different platform. Social media is not about technology. Technology is only an enabler of social media. Stop the obsession for having more “likes” on Facebook or more followers on Twitter. Start talking to people; be nice to them on Facebook, Twitter etc. Never forget to give a genuine thank you for a re-tweet. It’s all about giving and getting. If everyone focuses only on getting; there won’t be anyone to do the giving. Just be human. Be real. That is what social media is all about for me. Excellent post. I liked the originality of every single post on your blog. I'm reading a dozen of social media blogs but I feel reading the same over and over again. Then I found your blog! Dude, who ever would have thought having 100 followers as a criteria for being a power user must be insane. I've got 500 odd followers on ma twitter but I never get a re-tweet from any of those useless robots. Thanks a lot for the post. I'm going to learn a lot from you as I am also interested in this social media stuff. Keep writing! Thanks for the compliments :-) I'm happy that you liked the post. Glad to hear you are interested in SM stuff. Please do check out this blog here for my original posts, and be in touch with on my FB page http://www.facebook.com/amis.space for more resourceful articles I share from other bloggers as well.